1. In a baking dish, combine all the marinade ingredients and stir well. Add the tempeh strips in a single layer and ensure all of the tempeh is coated. 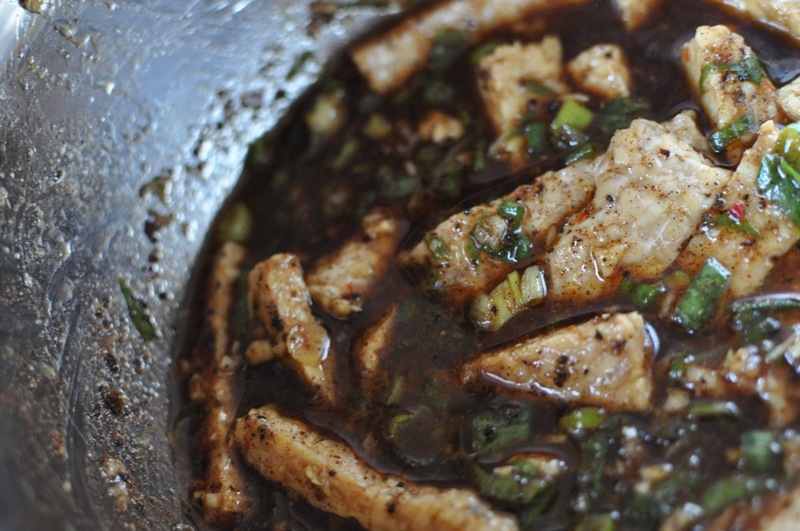 Place in the refrigerator and marinade for 20 to 30 minutes. 2. Heat a large sauté pan over medium-high heat. Add a tempeh, in a single layer, and most of the scallions. Reserve some of the marinade. Cook for about 10 to 12 minutes, flipping the tempeh and shaking the pan every few minutes until the tempeh is golden brown on all sides. 3. 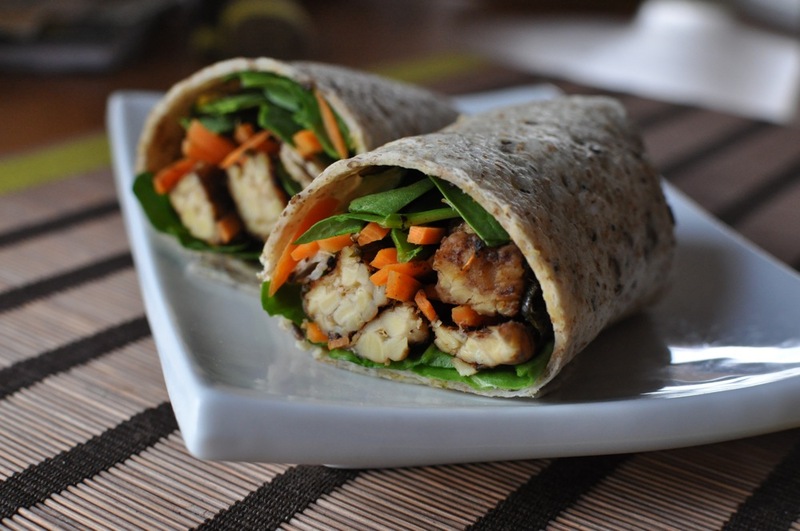 To assemble the wraps, lay a wrap flat, place about 4 to 6 strips of tempeh inside. Spoon some of the reserved marinade on the tempeh strips and fill in with the vegetables. Roll up wrap from one side and cut in half. Bravo, friend of Saveur, on a job well done. 🙂 These do sound fabulous–I love the combination of flavors in that marinade. I’m a fan of Jerk flavors so I think I will just have to give these a try. lovely blend of flavours–good one ! Hi Rob and hi Saveur , am new here but already loving it ! The intro is cute and the wraps perfect , ur right , i dont think u will ever have leftovers of this one ever! Hey Rob! I have a serious love of tempeh. There’s just something about it that I can’t quite shake. I will definitely be giving these wraps a try. And yes, tamarind is magical stuff. i’m glad we agree. I know! It definitely has more potential than simple tofu (though I’ll eat lots of that, too). I had no idea that Worcestershire had tamarind. Thanks for the tidbit! 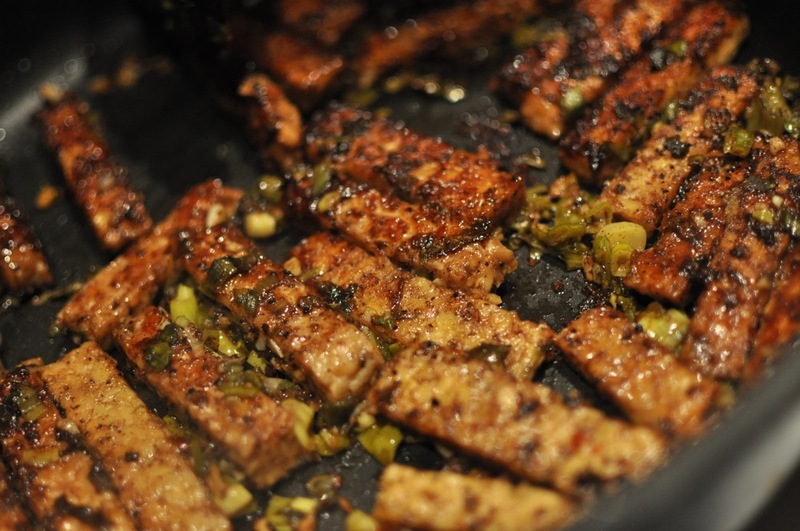 that jerk tempeh looks insane! what a great combination of flavors and textures. thanks for the recipe! These sound delish. However, I cannot get tempeh in Spain, what could I use a substitute please? Many thanks for your prompt reply. I also wondered about using quorn cutlets? Not so keen on tofu texture, but may be worth a try too. You do realize these look incredible right? The Tempeh looks SO GOOD. I would just point out that you should make sure to put a note that most Worcestershire sauce is not vegetarian if you’re going to post this in the vegetarian recipe category. There are some vegetarian Worcestershire sauces available. Great guest post! 🙂 When I get over my fear of tempeh I will have to try these. I have a surplus of tempeh in the freezer that I got on sale, so decided to make these wraps. I put shredded purple cabbage and carrots in the wraps, and served mine on Rudi’s GF tortillas and my husband got whole wheat tortillas. They are FABULOUS. The flavors are so intense and amazing.. my husband loves them very much and wants me to make them all the time now. A+ recipe!